Hurricane Rosa continued weakening as NASA's Aqua satellite passed overhead and collected temperature information. Satellite data showed that Rosa's center still off-shore from northwestern Mexico, but its clouds and rains had already stretched into Arizona and infrared data showed that rainfall potential. 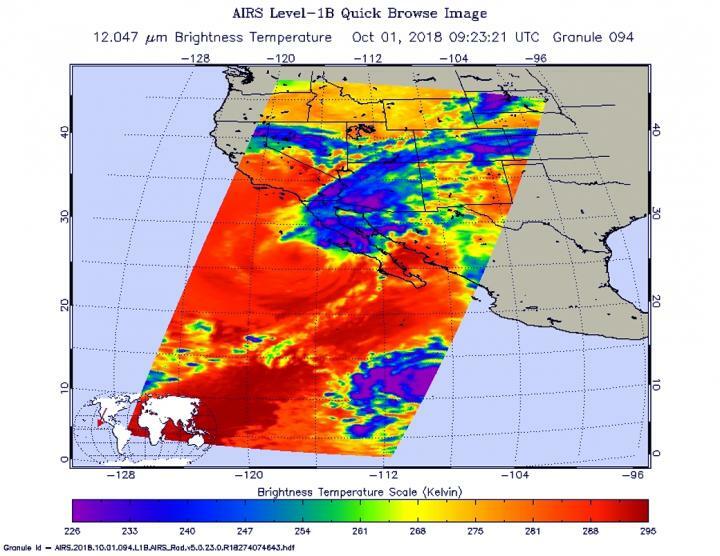 The Atmospheric Infrared Sounder or AIRS instrument aboard NASA's Aqua satellite passed over Tropical Storm Rosa on Oct. 1 at 5:23 a.m. EDT (0923 UTC). and analyzed the storm in infrared light. Infrared light provides temperature data and that's important when trying to understand how strong storms can be. The higher the cloud tops, the colder and the stronger they are. At 11 a.m. EDT (1500 UTC), NHC noted the center of Tropical Storm Rosa was located near latitude 27.5 degrees west and longitude 116.5 degrees west. That's 90 miles (140 km) west-southwest of Punta Eugenia, Mexico. Rosa is moving toward the north-northeast near 12 mph (19 km/h), and this general motion is expected to continue through Tuesday, Oct. 2. Maximum sustained winds are near 45 mph (75 kph) with higher gusts. Some weakening is forecast during the next 48 hours. Weakening is forecast through tonight while Rosa approaches and moves over the northern Baja California peninsula. On the forecast track, the center of Rosa will approach the central and northern Baja California peninsula later today, Oct. 1 and then move across the peninsula into the northern Gulf of California tonight. Rosa's remnants are then expected to move across the Desert Southwest on Tuesday, Oct. 2. Rosa is expected to become a remnant low over the southwestern United States on Tuesday. For updated forecasts on Rosa, visit: http://www.nhc.noaa.gov. For local forecasts and impacts in the U.S., visit: http://www.weather.gov.